Damselflies are ubiquitous at ponds and other slow moving areas of water throughout the United States. In total, approximately 135 species that fit into four families have been identified. Damselfly identification can be made a bit easier by remembers of few identification rules of thumb. First, like many dragonfly species, damselflies enjoy perching in the sun. Getting pictures and video clips of them is fairly easy and a great help for identification at a later date. The video clip shows a pair of Firetail damselflies mating. 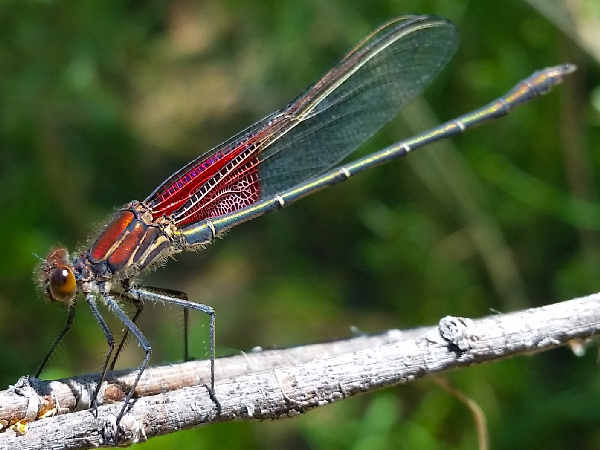 Second, with the exception of three or four species of Shadowdamsels and Threadtails in Arizona and Texas, the bulk of damselfly species fit into three families, the broad-winged, narrow-winged and spread-winged. 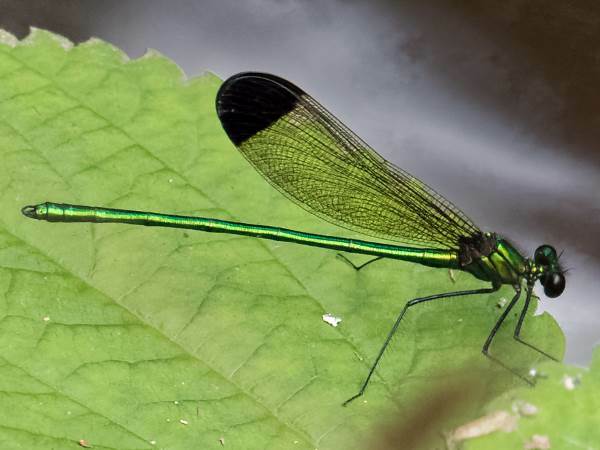 Based solely on the names, the shape and the position of the wings are a great way to begin the damselfly identification tasks. Damselfly species from both of the broadwing genera can be found near ponds and slow moving creeks and waterways around the United States. The focus on Broad-winged damselflies also points to a second good damselfly identification rule of thumb, color. For example, the Rubyspots, as shown in the top picture, consist of three species easily identified by the broad wings with a red spot on it. 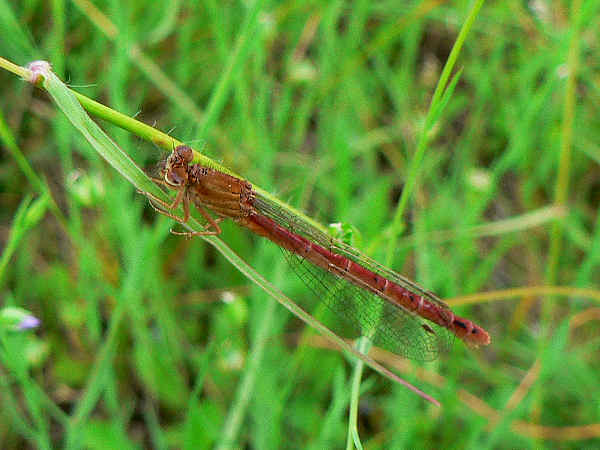 Jewelwings, the other category of broadwing damselflies, consist of five species, regionally distributed in the United States. The River Jewelwing, for example, lives in states along the northern border. 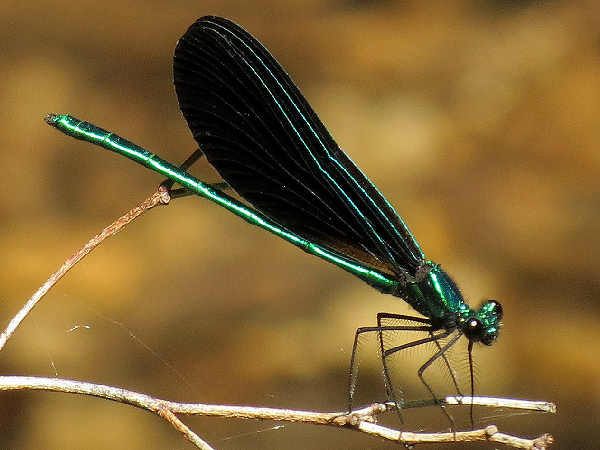 The Ebony Jewelwing in the picture is probably the most common of the species with a presence in states east of the Rocky Mountains. The Superb Jewelwing is a Notheast and New England specialty. TThe Applachian and Sparklinkg Jewelwing inhabit the Southeast. Taken together, many areas of the east coast of the United States support up to three different Jewelwing species. The picture shows a Sparkling Jewelwing. Only the tip of the wings are dark, making it easy to differentiate from the more common Ebony Jewelwing. They are easily recognized by their green bodies and broad wings with dark spots or hues to them. Females have a white stigmas near the tips of their wings. 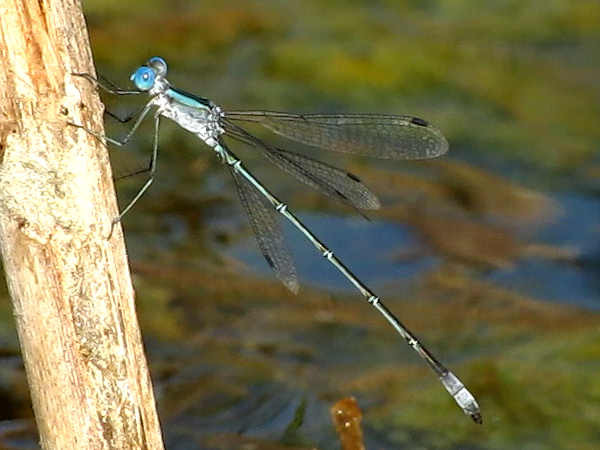 Spreadwing damselflies (Family Lestidae) can be initially identified by their open wings while perching. They divide into two genera and about twenty species. The Lestes account for most of the species. 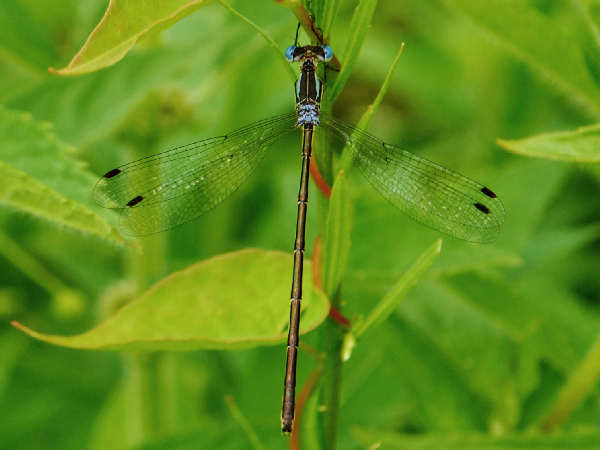 The picture shows a Slender Spreadwing. They are common through most of the Eastern United States. From the fairly common to the fairly rare category comes the Rainpool Spreadwing. It is a local specialty of the Lower Rio Grande Valley of Texas. 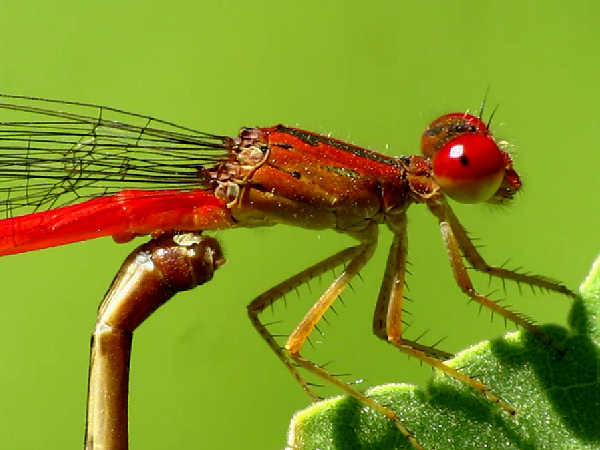 In the United States, the narrow winged damselflies, the typical damselflies seen at local ponds and backyards (Family Coenagrionidae) account for approximately 100 of the 125 identified species. When it comes to damselfly identification, the odds are very high that the typical damselfly anyone sees, fits into this family. As a group they tend to be weak flyers. Consequently, they tend to perch on low branches and leaves, making it fairly easy to take pictures of them. Press a button to learn more about some representative species in each of those narrow-winged damselfly genera. Before you go, here’s a quick overview of species from additional narrow-winged genera. Take note of the colorful bodies. They are a great help with damselfly identification. The picture at the top of his section of the Western Red Damsel (genus Amphiagrion) shows the basic look for both it and the Eastern Red Damsel counterpart. Often either of the two species would be the best first guess for any small red damselfly found along slow moving waters. In the southern areas of the United States from California east to Florida a handful of Firetail species (Telebasis) also have red bodies. One look at the next picture also confirms the ease of damselfly identification using body colors. The yellow face of the damselfly is a dead giveaway for the Caribbean Yellowface. While the identification might be easy, finding one is much more difficult. They are a tropical species that live around ponds in the very south of Texas and Florida. 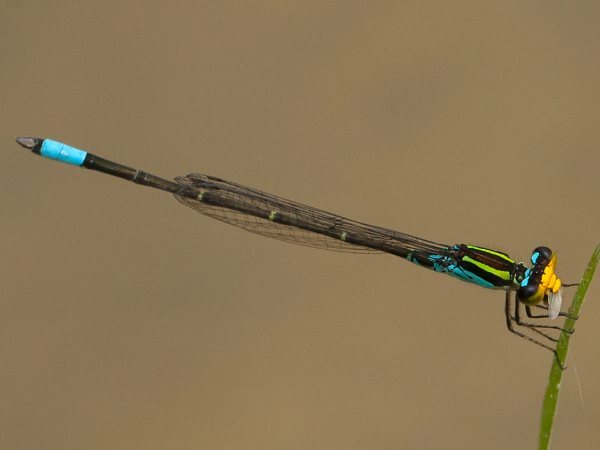 Finally, the Painted Damsels (Hesperagrion heterodoxum), genera does not quite exhaust the entire set of genera within the narrow-winged damselfly family. It’s a convenient place to wrap up the category. 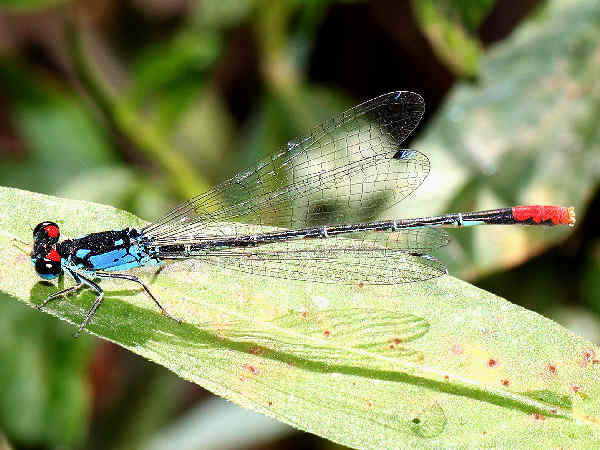 The colorful tail and eyes, insures an easy damselfly identification in the field. They are a Southwest specialty.